Inspired by this GameDev question. What are these clever tricks that allowed some 3D games to be rendered so quickly on the hardware? Elite approximates solid objects through convex objects. Because every game object (other than the missile) is convex that means by definition that every hypothetical ray of vision from your eye to the object other than generate edge cases must pass through it exactly twice: once through a front face and once through a back. So just eliminating the back faces makes any single object appear to be solid when set on its own against a black background. Back-face culling is a standard technique that remains in use as it cuts the work for any closed object, but in Elite the further requirement of object convexity helps to give the illusion of solidness. Elite and many other games also use split-precision arithmetic. Individual objects are small but in a much larger space. So objects themselves have local geometry stored in 8 bits and rotated using 8-bit arithmetic. The object centre exists in a 16-bit (or larger) space and is subject to 16-bit arithmetic. Having located the centre in 16-bit space, sign extend and add the 8-bit results to get all intermediate results in 16-bit while having saved a lot on arithmetic. There are cheap and compact lookup-table approaches for 8-bit multiplication based on 8-bit lookup tables and simple addition so the saving is very substantial. 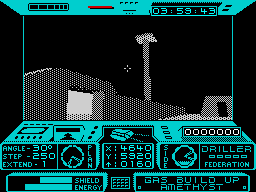 Plain vector games like Elite often do partial screen updates essentially by accident. It's too expensive to clear a whole frame buffer or to keep a spare and lines very rarely overlap. So they XOR objects in and then XOR them out again. As and when they can't keep up with the output frame rate, which is usually, that has the effect that objects across the screen are updated sequentially. When the screen becomes full you can see one move, then the next, then the next, etc. Even as early as I, Of the Mask, animated scenes were being prerendered and replayed as a sequence of 2d draw calls, with some sprites added on top for gameplay. This presages interactive movies by about a decade. 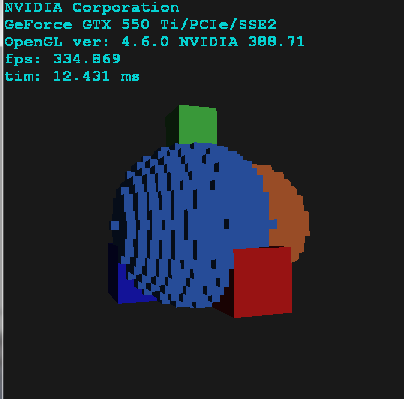 Rescue on Fractalus probably begins the line for games based on a voxel heightmap, and does what it does on an Atari by leaving most of the surface details very implicit. It's drawing verticals of a uniform colour and just putting pixels on top because it's cheap to update a vertical of one height to another, and the pixels although sparse are enough to fire the imagination. Later games like Commanche could afford whole-buffer updates. It might not be immediately obvious, but the 8-bit versions of Stunt Car Racer also assume they're filling a vertical space for faster solid graphics. They do not allow the car to roll beyond a certain amount, and when it does you can see the area underneath the track soft of rotate with you. So it's not really filling polygons so much as maintaining a 1d height map. As almost everybody knows, Wolfenstein's optimisations are (i) to restrict walls to a single height and vertical location, collapsing the problem of drawing from 3d to 2d; and (ii) requiring them to be on grid boundaries, for a simple per-column test without prior knowledge. Restriction (i) also makes each column a line of constant depth. Which means no per-pixel divides. The limited number of potential outcomes also allows all per-column possibilities to be precomputed. Doom keeps similar per-pixel optimisations for wall rasterisation but completely replaces the logic as to what should be drawn by using a structure called a binary-space partition ('BSP') tree that allows a very fast back-to-front sorting of level geometry and ensures geometry is arranged in advance so that sorting by depth is always sufficient for a correct drawing. Allowing geometry not to overlap vertically further collapses the amount of work necessary to decide which bits of walls remain visible after having sorted them. Quake does a similar thing with a BSP tree but adds an additional structure for broad-phase elimination of sections of the world called a potentially-visible set. A side effect of putting a structure into a BSP tree is that you end up with a bunch of convex sectors that the player can stand in. Quake keeps a compact list in each sector of which other sectors could be visible. That allows huge parts of the BSP traversing and therefore of span comparison to be skipped entirely. Games like Descent go a different way with convex sectors, rendering from that which the camera is in outwards and clipping each further sector to the portion of the display still unfilled by closer sectors. That's full-fat portal rendering: the surfaces that join sectors are 'portals' and the portals are the be all and end all for scene graph traversal and for visibility. Later but still retro games often use portals in a less strict manner as merely a broad phase for whether a section of the map might possibly be visible, particularly if they have a GPU that can report something like 'if I were to draw that polygon, [some/none] pixels would be drawn'. Games still do that, but I'm aware of it being implemented at least as far back as Mario 64 and twenty years passes my test for retro. A different branch of games going back at least to Alone in the Dark prerenders the background and simply superimposes the moving objects. Some knowledge of the full-scene geometry is retained for collisions and clipping but most isn't retained at runtime. In Alone in the Dark pixel artists created the backgrounds. In Resident Evil they were CG rendered. Little Big Adventure II is probably the most interesting branch of that system of thinking: it has the full 3d geometry of its outdoor world but presents it through fixed cameras. Each time the camera changes it pre-renders the background with depth information, after which only the main characters are redrawn in realtime. That causes a 0.5 second lag when changing camera, but that alone isn't jarring for the genre. The Microsoft Talisman project from the mid-'90s tried something very close to what you're asking. It would start by rendering a frame as a sequence of tiles and submitting those to the GPU. It would approximate the next frame and possibly the one after that by having the GPU simply manipulate the original tiles based on the camera difference — rotate them, move them around, scale them, all of them independently of each other. Then when the CPU had prepared the next entirely-new frame, it would submit it. So you got perfect key frames plus approximate intermediaries. It was implemented and previewed, but missed its window for success as the ordinary 3d accelerators appeared on the market. EDIT: also suddenly returning from the back of my the memory, a special word for Parsoft Interactive and the line of flight simulators up to 1996's 'A-10 Cuba!'. They were software developers that started on the Mac in the late-'80s, which means a massive display compared to processing ability. So they used a system of per-scan frame differencing to publish only the differences. Imagine a big green polygon that's rotating. The centre essentially remains the same so if you can figure how to redraw only the edges in less time than it takes just to redraw the centre then that's a win. Exactly how they did it seems to be vague but I'll bet it's just a matter of inserting spans into a structure that you can then traverse in x order (probably O(log n)) and performing a linear differencing of this frame and the previous at the end (in O(n)). That's almost certainly why they were still pushing solid colour polygons as late as 1996, but also why they could do a pretty good frame rate at 1024x768x8bpp on a 68040, and a fantastic frame rate at 1280x1024 on my unaccelerated Pentium of 1996. Which was the best the monitor could display. If it would be possible to see a particular kind of wall surface at one of four different distances from the player on the left, four distances on the right, and four distances up ahead, a game would have twelve pictures of that wall surface--one for each of those circumstances where it might be shown. If the walls include 3d features like alcoves, different views would often be drawn or painted by a human artist, then scanned and scaled, and finally cleaned up by hand. At no point would any actual 3d rendering be involved (except by the human artist). Any isometric game can reuse an already rendered frame. As there is no real perspective the movement of camera/player is really just panning/scrolling the x,y. And usually by one or fraction of one tile so the render could be highly optimized. Also 3D polygons where sometimes rendered as sprites into isometric engines – see Diablo1 (at least I suspect they use it) as an example. It's hard to say if they do it on game runtime (during init) or during game development or at all (an all is pixel art instead). Pseudo 3D raycasting Wolfenstein3D and Doom3D techniques are rendered whole each frame. The only thing that could be speed-ed up by scrolling is the ray cast intersection list acquisition (map in top left) but that makes no sense as the added code will not gain anything (unless very large map is used with high visibility depth) and probably would even slow things down due to branching. Sadly for real unconstrained 3D engines is this not an option. Instead if speed is not good wireframe techniques where used to speed up. Or even combined with sprites. Caching meshes as sprites is possible only if the view has no real perspective or the rendered object is in the "same" distance (like background) or very far so its relative distance does not change too much. Apart of all this there is one technique used for 3D raytracer to speed up the rendering that is unique to these renders. It is using stochastic approach for branching. Basic ray tracers works like that you cast ray when it hit something it either reflects or both reflect and refract and this is recursive up to some layer. This can be speeded up by using pseudo random approach where the split of ray is not happening. Instead the ray has 50% chance to reflect and 50% to refract. And on top of that usually few frames are merged together. This way we can have much higher speed for the same recursion layer at the cost of quality (the image is a bit noisy like from CCD camera). This technique is fairly common in GLSL as it allows to use the underlying architecture in similar manner than polygonal rendering which is not the case for recursive ray split. One technique that has not been mentionned (well, it kind-of has, but not under its actual name) is the "impostors" (or "imposters") technique. It consists in drawing some 3D objects of the scene with a very rough approximation of their angle to the camera, and updating this angle only when really, really needed (by that we mean: only when the human eye would start noticing that this object doesn't seem to be "turning" as it should). - rendering small objects. The extreme version of this technique is the billboard, when every object is constantly facing the player, and the game designer decides that the objects should never turn (their angle to the camera is forever fixed). It can be made more permissive by deciding that the object can have 4 fixed angles to the camera (front, sides, back) or even 8 (for example, in Doom, barrels and lampposts always face the player -- that means only one fixed angle to the player, while enemies can be seen from 8 angles). Please note that this can be achieved in two ways : either the object is a sprite previously drawn in 2D (as in Doom), or it's just re-rendered at the required angle. 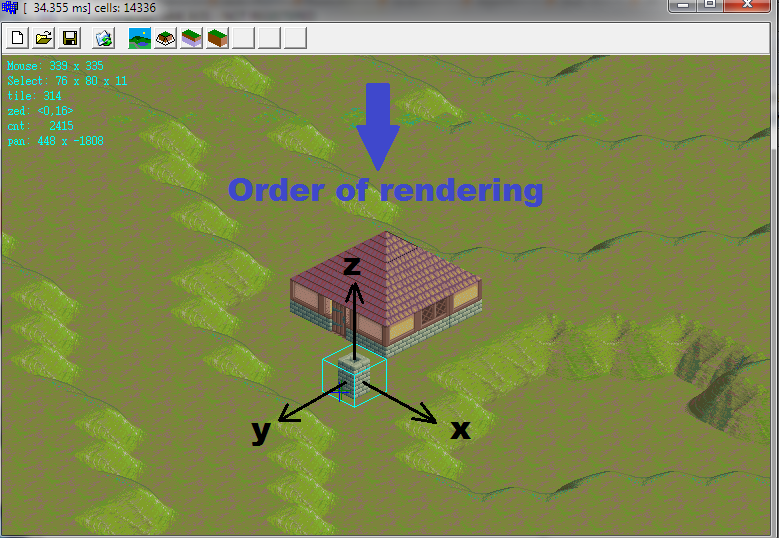 Having just a few allowed angles makes the following optimisations available : 1) you can cache the few renderings of the object seen from each angle, as 2D images, 2) since the angles have discreet values, you can restrict the calculation space (for example if you pre-calculate and store in memory all the cos and sin values for these angles), and 3) if you have many objects to display, most of the will be seen under the same angle, so you can use the same cached rendered version many times (for example if you draw trees you can copy and paste the same tree seen from a handful of angles many times, by just scaling down the sprite depending on the distance). That's also sometimes used to render a crowd (like the stadium's audience in old sportsgames or the people on the side of the road in car racing games). - rendering large, complex, distant objects. The key here is that these objects are distant. It means that their angle with the camera will change very slowly (even if the player/camera moves sideways for a long time, the mountain in the distance will look almost the same. therefore, the payer doesn't notice if you don't redraw it as much as it should). 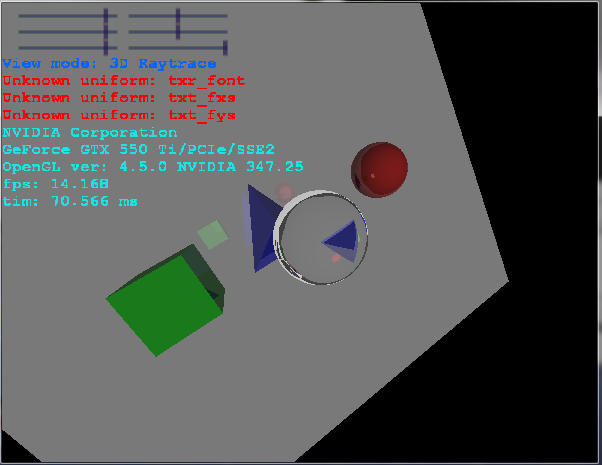 If the player/camera turns, then the distant object is just moved sideways on the screen (or just projected onto a skybox that gets rotated, as described below), but doesn't change, so it is not redrawn. From time to time, if the camera moves to much, then simply re-render the complex object as seen from the new angle. Since that doesn't happen often, it's not too costly. it can be processed in a parallel thread. That technique is used in open-world games, like Skyrim, GTA, etc. You could consider it as an impostor pushed to the extreme : the object (the sky, the sun, te clouds...) is so distant that its angle to the camera will never, ever change. So all you have to do is render it once and for all onto the screen and move it accordingly to the player looking up/down/left/right. As always, you can decide to render it from a 3D model (if you're rendering a complex, slowly-changing object such as a cloud) or from an actual 2D drawing. You never need to scale it because it always remains at infinite distance. In order to rationalize that lateral movement (up/downleft/right) of the 2D rendered object that occupies the entire field of vision (like the sky), you project it onto a very large cube created areound the scene (the player is inside the giant cube). You might want to apply a slight distortion of your 2D-rendered sky at the limits between each face of the cube, so that it's not too obvious that the sky is actually a cube. And voilà. It helps to understand what the main limitations of 3D graphics where back in the day. Memory bandwidth was very limited, and early computers often stored graphics in a format that made changing individual pixels or spans of pixels expensive (e.g. Amiga bitplanes). As such it often helped to move 3D rendering away from graphics RAM and into some faster RAM which lessened the effect of overdraw. This was common on the Amiga in later years, and was often combined with a conversion from a convenient graphics format to the Amiga display format which made use of the otherwise dead time between memory access cycles. Also, floating point mathematics were very expensive due to most CPUs not having an FPU, and even FPUs being fairly low performance by modern standards. As such it was common to used fixed precision floating point, or simply use integer maths scaled up by say 10,000x. Operations like division, multiplication and sine/cosine were expensive too so optimizations such as using binary shifts and lookup takes were necessary.